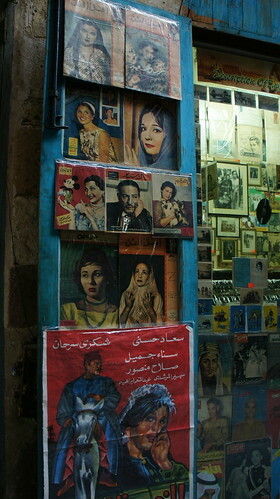 If you have ever been to the famous Khan El-Khalili quarter, I am sure that you stopped at small bookshop inside selling old magazines and posters. 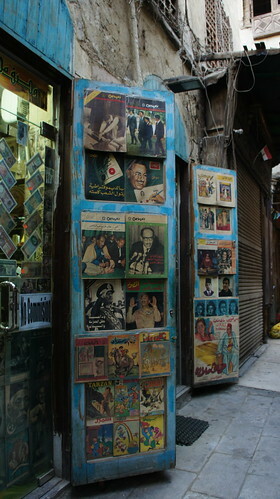 It is the place to find old pricey newspapers and magazines in good condition if you are ready to spend a lot of money and do not like buying old magazines and newspapers from El-Azbakeya market for old and used books in Cairo. 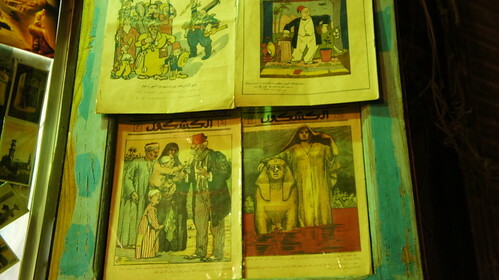 As I hinted the old magazines and newspapers are pricey, they are not cheap at all compared to other places in Cairo. 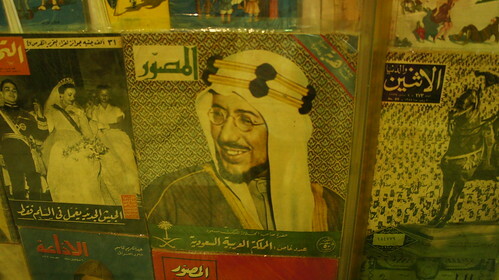 An old magazine from the Royal Family era pre-1952 can reach up to LE 1,200. 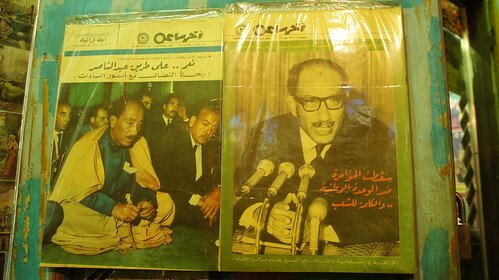 The collections of magazines from that era already include magazines that I have never heard of like El-Kashkol “The Notebook” magazine. There was an issue from "El-Kashkol" magazine featuring Saad Pasha Zaghlol on its cover in a comic from the 1920s I assume. 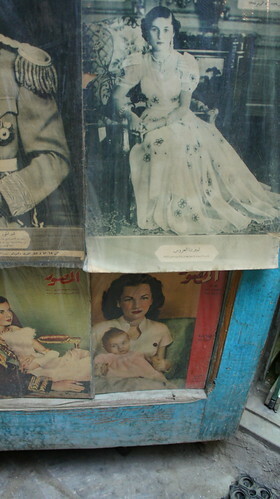 I did not imagine magazines would survive all that time in Egypt outside archives and private collections. 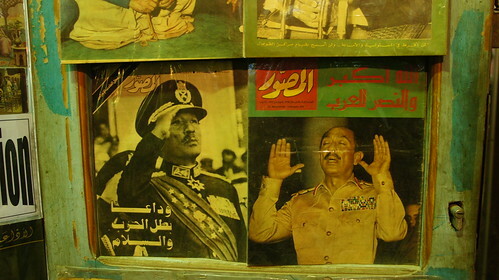 Now an old magazine from Nasser era or Sadat era could reach up to LE 700. The shop also got old newspapers from that era. Of course we are speaking about special newspapers issues. Wisely the Bookshop owner and keepers organized the magazines with eras and themes. 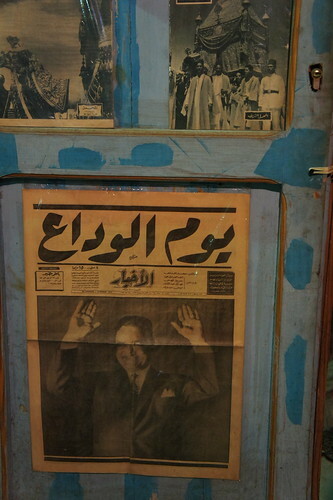 Just as you noticed above you got the collection of President Sadat and President Nasser as well the Mohamed Ali Royal Family. There was a collection of entertainment and showbiz magazines showing old actors and stars on magazines’ covers from 1940s till 1960s. 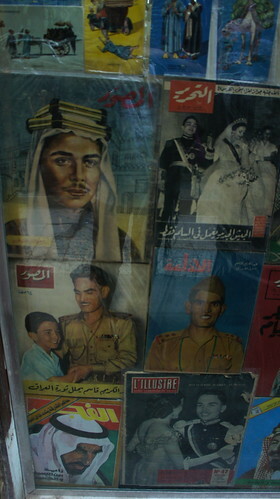 There was interesting collection showing old Arab kings and Presidents on the cover of old Egyptian magazines like King Hussein of Jordan and King Abdel Azizi Al-Saud of Saudi Arabia as well late Iraqi president Abdel Karim Kassem. 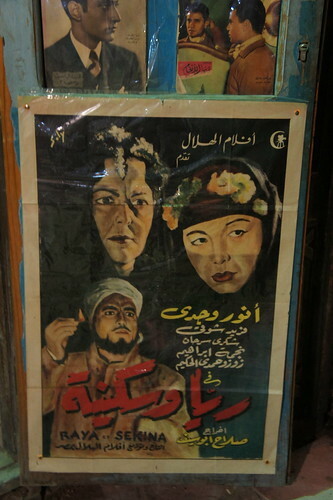 The shop also sells reproduced old Egyptian films posters as well orientalist paintings of Egypt and Orient as well post stamps. 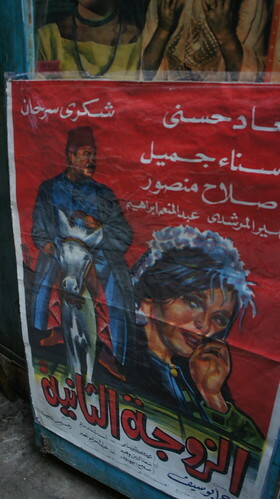 The second wife film poster "1960s"
"A Day from my life" starring Halim poster. 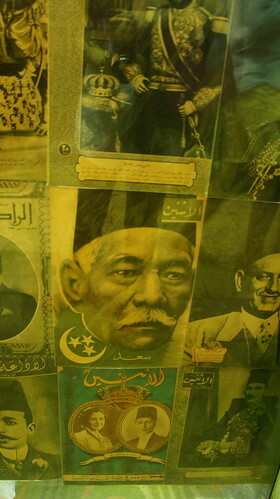 If you go to Khan El-Khalili, do not forget to visit that interesting place. Those photos were taken in 2012 and 2015 by the way. lovely post - did you find out the name of the place? 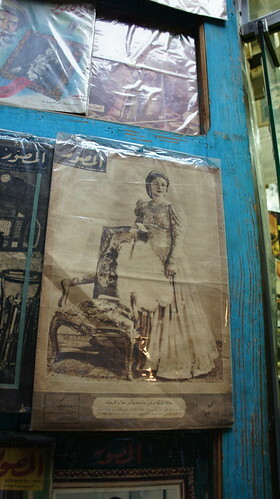 MUCH RESPECTFUL Ms.ZEINOBIA/ALL i've got to say to your 2 years' old article & photos WOW/WOW/& WOW ,I was flabbergasted by seeing those photos of THIS WONDERFUL+AMAZING Antiques/Book shop in KHAN EL KHALILI/CAIRO(iwish the Owner-s A Very GOOD LUCK & Unlimited PROSPERITY+ Continuous SUCCESS!!)... Which Watered my mouth,i wished if i could BE BEAMED UP like Dr.SPOCK in that American 1970/80s TV series STAR TREK do you remember? ?,and re-assembled in That ALADDIN'S TREASURES' CAVE in Khan-El-Khalili? ?Just leave me in there,lock the doors and Throw the keys away, it seems to me like being> ALICE in the Wonderland->to me,or a journey through the TIME MACHINE,my YOUTH will return undoubtedly and i'll feel there as a child/teen-ager in Toy-land> once again,& will re-fuel my memory with each magazine> Cover+Article+Photo+Cartoon as if i was United ONCE again with all my LOST & FOUND BELOVED->ONES? 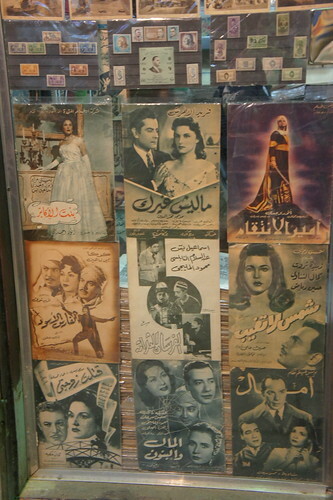 !Those film POSTERS,which & as we Kids,used to beg the theatre owners in Beirut city or in ALEY town< a summer-time resort we went,to give me Just a copy to hang them on my room walls,even though in those 1950/60s AL-KAWAKEB+AKHER SAA+AL GUILL weeklies used to make centre-spreads of my beloved Male/Female films SUPER-Stars,but those posters were like >WORKS OF ART, to me?..Even impatiently waited for the days the new movie began so that i or we KIDS may get one of them if LUCKY enough!! (WARDA part 2)->FAREWELL! !I AM ONLY SCARED OF ONE WORD..FAREWELL or AL WADAA3/ Many were the times >YOU,Most beloved WARDA(Rose) sang it in YOUR great concerts,but never were aware that one day we will sing it ..on that horrible Thursday morning of May 17th/2012 for YOU & FOR THE LAST 5 years WE STILL DO.. & TO THIS DAY as well?! BUT WE ALL DID, when we heard that shocking news,we farewelled YOU Dearest LADY with oceans of tears, we asked for a miracle like YOU sang: ANA AYZA MO3'GEZA ,THAT.. that what we heard was.. a LIE & senseless rumors as usually did happen many times before,but NO..this time looked -like the Heavens above opened its door-s,and THE RED carpet, knitted by Divinities RED ROSES was waiting for you to walk on and join the other GREATS that were there ,long before YOU Our MOST BELOVED ROSE ,to join them in that PEACEFUL Eternity! !..Since the early 1960s when YOU sang and appeared in YOUR first Egyptian movie ALMAZ WA ABDEL HAMOULY, ISS'AL DMOU3 3AYNEYA<(ASK MY TEARFUL EYES) + YA NAKHLETEIN FIL 3ALALI(TWO SKY REACHING PALM TREES)Those infamous 60s/70s songs..your snowball of success..ROLLED since,and lasted 5>6 decades of continuous GIVING us all the joy any individual with A HEART OF GOLD,,may donate to the world? !YOU will always be remembered with your hundreds of songs + almost 20 or more Movies + TV Dramas & MUSICALS..In 1950s we knew YOU AS WARDA EL GAZAERI'YAH,as YOU originally were from..LAND OF OVER 1 MILLION FREEDOM FIGHTING MARTYRS,& INSPIRED THE ARAB-wORLD with YOUR National + Patriotic songs and Represented ALGERIA the best any Algerian ever WOULD or COULD,..THE war heroine Lady GAMILA BU HAREED did HER bit as YOU to did with YOUR heroic voice for liberation of that beloved North AFRO-ARAB Nation ALGERIA!! Egypt loved YOU and adopted your qualifications and fueled them,in return YOU gave Egypt and also the whole Arab-World all you've got and were GOD given VOICE that invaded our Hearts + Souls,and made its NEST in itSOME LOVE< left in Human" hearts,YOU'LL be in there & forever!! once YOU sang -> WAHASHTOUNI.. WAHASHTOUNI.. WAHASHTOUNI ,same HERE, WE DO MISS,, MISS.. MISS.. YOU A LOT too,Thank you for everything you left us WITH immersed by your...tears/sweats/valuable time and went all of a sudden and as quietly as YOU came those decades ago..very quietly YOU returned to the >ONE< whom gave us THE MOST BELOVED ROSE/WARDA IN the garden of EDEN AS A TRUSTED GIFT..that filled our lives with H A P P I N E S S for at least 50 LONG years?!... Almost some kind of AROUSS EL NIL you can be described by,or THE BRIDE OF NILE RIVER? 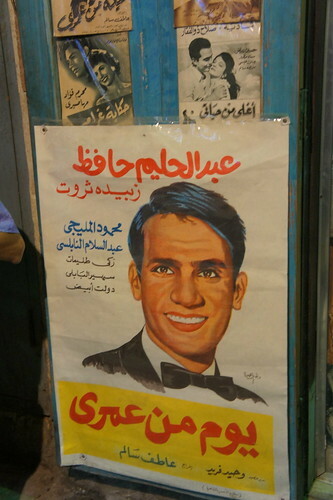 !As YOU passed away in CAIRO..as well! !YOU played ALMAZ(DIAMOND) in that movie & in fact you were and always WILL stay The ETERNAL DIAMOND in the world of Entertainment that GLITTERS constantly and VERY PRECIOUS TOO..and makes us proud for having A LADY of YOUR CALIBER & good self in our part of this world!..ALLAH YERHAMEK YA AGHLA WA AHLA WARDA FIL WOU'GOOD..May GOD BLESS YOUR SWEET MEMORY ..YOU>..YOU> THE MOST PRECIOUS & BEAUTIFUL ROSE/EVER PLANTED AND PICKED IN OUR WORLD!!.... Regards from /Mr,NostalgiA<iS-hak Barsoumian/LONDON-G.Britain.